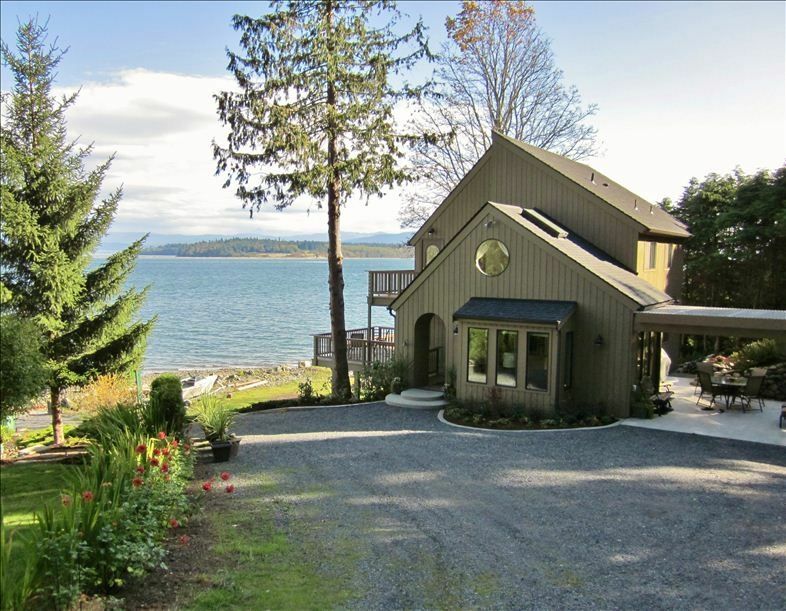 Welcome to Golden Hours 2, a beautiful, newly-remodeled beachfront home on Lummi Island's only beach with extended tideflats. You will marvel at the spectacular 180 degree view of majestic Mount Baker, Canadian Mountains, Bellingham city lights, and the abundant wildlife of Hale Passage from all three decks and every room. The home contains a lovely blend of contemporary and antique furnishings, with thoughtful attention to every detail. There are many comfortable seats for dining and entertaining, both inside and out. In addition to the three view-inspiring decks, there is a large outdoor covered patio with gas barbeque and sitting area. The main floor of the house is handicap accessible, including one bedroom with queen size bed, television, desk, and rocking chair. Also on that level are the kitchen, dining room, family room and bathroom. The cozy family room with leather recliners, media center, and dinette set may become your favorite spot. In the sunken living room there is a tiled corner fireplace, music system, leather furniture and a marvelous panoramic view of the beach and mountains. The bright kitchen includes all new appliances and custom maple cabinets. The large upstairs master bedroom suite features a king-size bed, flatscreen television and DVD player, sitting area, and private deck. A corner jetted tub highlights the master bathroom. The second upstairs bedroom features queen bed, television and sitting area. Golden Hours 2 is within walking distance from the Lummi Island Ferry Dock, Islander Grocery Store, and Beach Store Cafe. There are roughly 10 miles of winding island roads for hikers and bikers, which mostly follow the shoreline and provide wonderful Puget Sound and San Juan Island Views. Bring your kayaks, jet skis or boats; trailer launching is available at medium to high tide. **NOTE: We disclaim any liability in regard to safety, swimming, damage or loss to boat or equipment. Clams, crabs and oysters are present, and seashells, agates, and seaglass are all fun beachcombing pursuits. Eagles, herons, deer and otters are often seen right on the beach. Equipment for numerous outdoor games is included, as well as marshmallow sticks for the beachside firepit. Several day trip destinations are within an hour's drive after leaving the island, including Vancouver BC, Mount Baker, Lynden and Bellingham. Bring your family and friends, Golden Hours 2 is perfect for get togethers of all kinds and for all ages. You will create wonderful memories and enjoy hours of fun and relaxation. Hopefully our vacation rental will become your home-away-from-home for many 'Golden Hours' Vacations. See you soon! Please check our calendar for available dates. Sorry, but no pets are allowed. Golden Hours 2 was built in 1987 by us for Gary's Parents' retirement home. They enjoyed it until they moved off-island in 2004. Many of the furnishings were his grandparents. The custom stained glass and most upholstery work were created by his mother. All of the rock walls on this property and the adjoining parcel were built by Gary from the rocks on the beach. The landscaping and garden design are the creations of Liz. In the early spring over 2000 bulbs come to life. The rest of the year, the foliage is a creative mix of rare and common plants. The adjacent property (Golden Hours) is still a family cabin, started in 1939, and expanded throughout the years. Various relatives enjoy the cabin periodically. In the summer of 2010, Golden Hours 2 was extensively remodeled to further enhance the lovely features. Now it is ready for your enjoyment! House is located 50ft from high tide with easy beach access. Covered swing in yard next to beach. 80 ft leveled beach sitting area at water's edge, includes outdoor shelter, firepit (wood provided), roasting sticks for marshmallows, picnic table and chairs. Child's covered sandbox. Beach chairs, hammock, and hanging chairs in shelter. Propane beach cooker. Spectacular views of Mount Baker, the Twin Sisters, and Canadian Cascades during the day, with the lights of Bellingham and the mainland at night. There is a fold out leather couch (queen size) in the living room with bedding available that will sleep an additional two guests. With ice maker/chilled filtered water. Paper towels, napkins, plastic bags, aluminum foil, paper plates and plastic wrap included. Cable TV. (4) televisions - (1) each bedroom & family/sitting room. BluRay DVD Player in family room. Under counter CD player/radio in kitchen living room with 'I' pod hookups. Toys and games for all ages inside and out. Balcony deck off master bedroom, panoramic beach views. (2) Covered patio behind house with comfortable seating and tables. Panoramic views and seating on front side facing the beach. Wheelchair accessiblity on main floor. Includes access to kitchen, family room, dining room, queen bedroom, bathroom, and deck. 4 steps down to sunken living room. With help, wheelchair access to beach is possible. Electric Fireplace (Living Room). Boat Launch available-confirm prior to use. Buoy available for boat moorage. Other Misc items available: Beachcombing shoes & boots, yard games including badminton, croquet, tetherball, kiddie pool, infant swing, kiddie picnic table and other outdoor toys.